The Bradford artist Elizabeth Ann Hamlyn was born in Bandon, near Cork in Ireland, the daughter of an army officer who was serving there. Her father moved the family to Holt in 1817 and he became the minister of the Independent Chapel. She married the Rev James Tackle in 1832, living in the manse attached to the Countess of Huntingdon’s Chapel in Huntingdon Street in Bearfield, Bradford on Avon. Ten years later they moved to 41 Frome Road, near the canal bridge, where they opened a school, where Elizabeth taught drawing. They and the school next moved in 1859 to Avon Villa, a bigger house in Trowbridge Road where there was also room for a flower nursery. 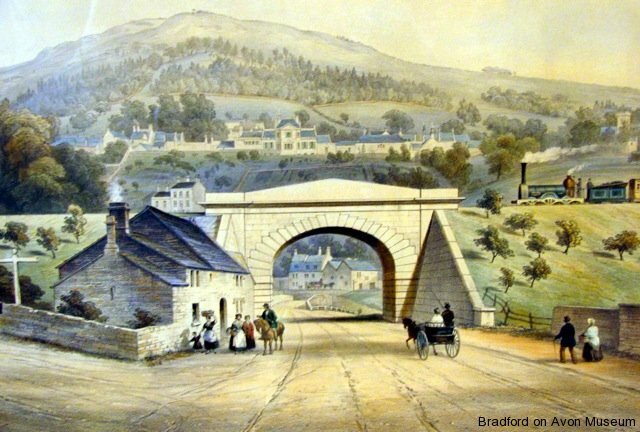 Mrs Tackle drew and painted scenes around Bradford and the Avon valley, capturing the period in the 1840s and 1850s when transport was being revolutionised by the building of the railways. Only three original paintings are known -two at The Hall and one in Bradford on Avon Museum, all commissioned by Stephen Moulton. 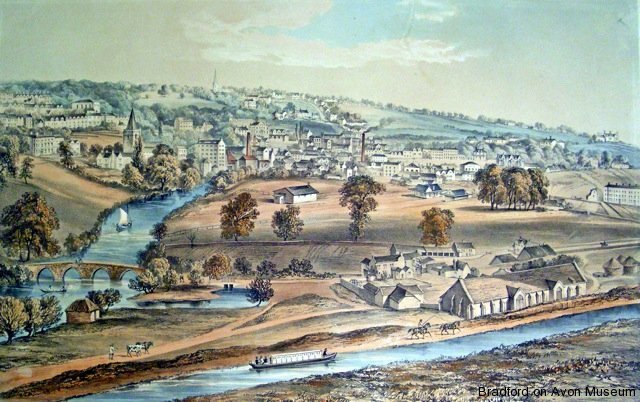 Several other of her views were reproduced as lithographs, some of which she may have done herself after learning the technique. 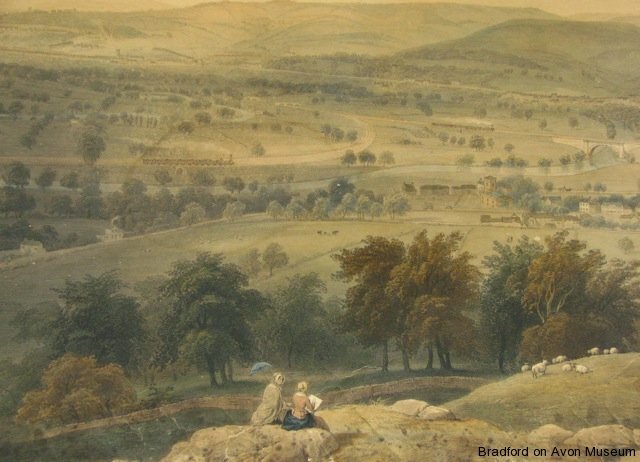 The best-known view by Mrs Tackle is of Bradford from the hill on the way to Westwood. It shows the canal and Barton Farm in the foreground, with one of the fast fly-boats that shuttled between Bradford and Bath hauled by two horses. Beyond, the railway station and its goods shed had been built in 1848, but the rails and bridge over the river didn’t arrive until 1857. The Museum’s copy once belonged to Bradford Urban District Council. 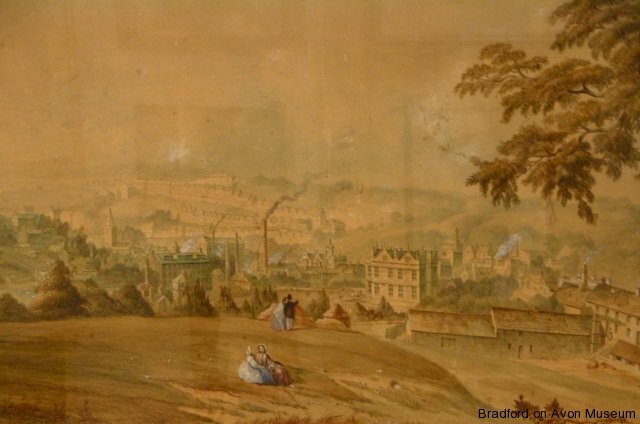 The sole original watercolour painting by Mrs Tackle in Bradford Museum’s collection is this large view of the town, seen from the low hill above The Hall. It captures Bradford as a working industrial town, with all its smoking factory chimneys. It was commissioned by Stephen Moulton of The Hall, whose family is perhaps seen in the foreground. John Moulton gave it to the Urban District Council, of which he was Chairman. 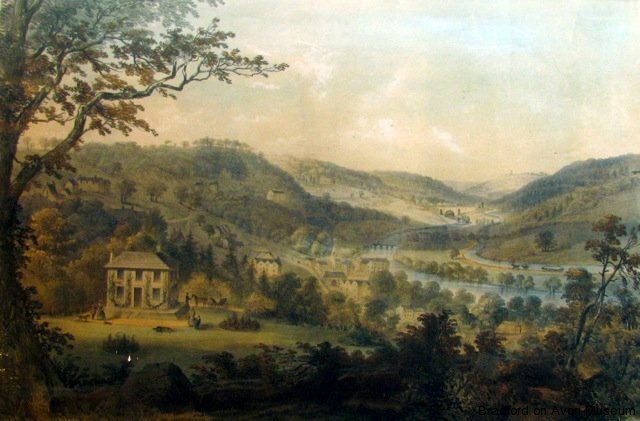 The other Tackle picture that derived from the Urban District Council is a lithograph view from the quarries at Brown’s Folly in Monkton Farleigh, looking westwards across Bathampton and Batheaston towards the city of Bath. Trains can be seen on the Great Western Railway, heading for London and on the Wilts Somerset & Weymouth railway approaching Bathampton Junction. Another view over Bradford from the road to Westwood, but further down the valley. The main feature in front of the church and the terraces and factories of the town is medieval Barton Bridge. Again the railway has yet to appear, adding a timber viaduct beyond the old bridge and a cutting on the left. 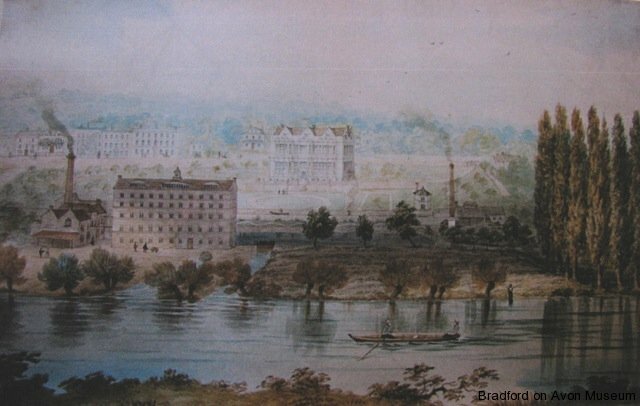 This painting shows the buildings that belonged to Stephen Moulton and his rubber facories. At the centre is the ancient mansion known as The Hall, with the old Kingston Mill in front and to the left. 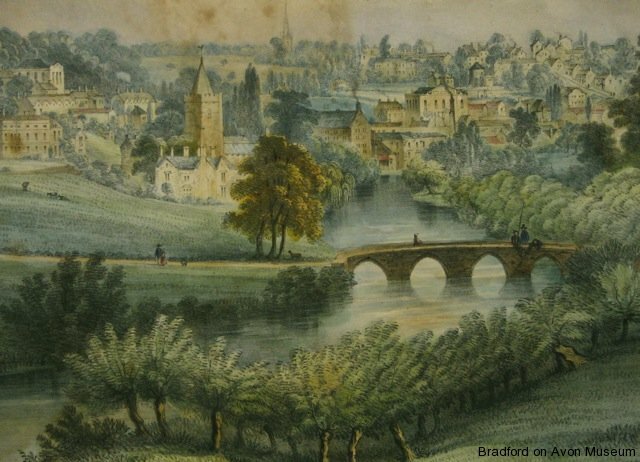 Down the gorge-like Avon Valley this lithograph has Stoke ~Villa, Limpley Stoke in the foreground, with Stokeford Bridge, Dundas Aqueduct beyond and the tower of Brown’s Folly on its hill in the distance. The railway has yet to be built and the fly-boat is hurrying towards Bath on the Kennet & Avon Canal on the right. This is the only Tackle picture that is outside the Bradford Hundred and then only just. The lithograph shows the Great Western Railway bridge at Bathford, Somerset, with a “Firefly” class locomotive pulling a train towards London. The Bradford Road leads past the Crown Inn to ascend the hills beyond Bathford village. 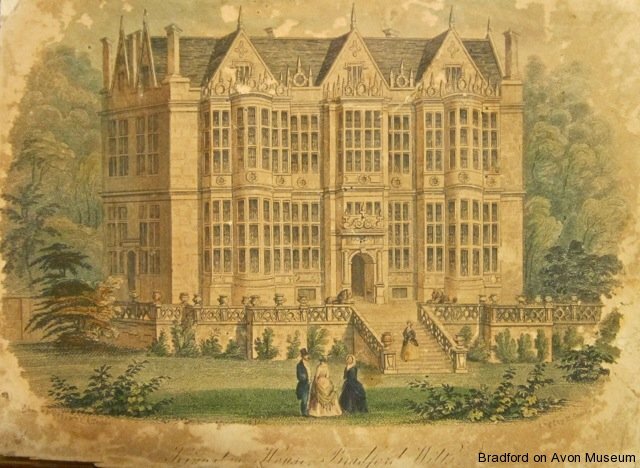 A small lithographic print showing the main front of The Hall. The Museum’s copy has been grazed upon by insects in places.